For four nights in October CNN will present its live TV broadcast and offer unrestricted access to the network’s presidential debate programming through CNN.com and via CNN’s apps for iPhone and iPad. From 7 PM to midnight, October 3, 11, 16 and 22, anyone with an internet or mobile connection can view CNN TV’s news, analysis and live coverage. In addition, viewers watching the debates on CNN.com can capture and share live TV video clips on the fly and share them within their social media circles using new “clip-and-share” editing features. The first news organization to offer cable, satellite and Telco subscribers its 24-7 television networks through the Web, CNN will tap the same technology to live stream 5 hours of programming each night of the debates. The digital offerings will introduce a whole new audience to the ways they can stay connected with CNN wherever they are. Displayed in a brilliant 768 x 432 HD video player, complete with closed captioning, CNN’s full coverage will air on CNN.com/debates. The technology will also enable anyone who begins watching the debate after it begins to ‘start-over’ from the beginning. 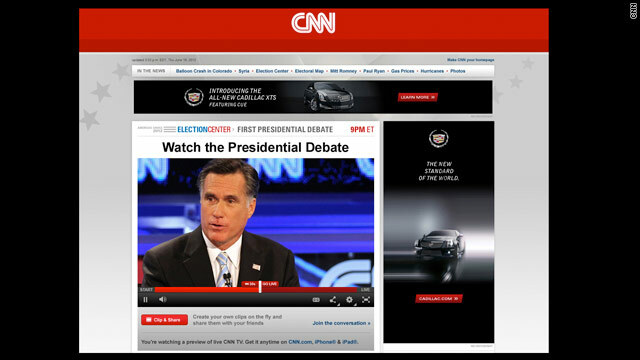 A truly interactive destination, CNN.com/debates will feature companion content including a live blog, on-demand videos and articles, candidate profiles, social media integrations and a Social Buzz meter. On October 3, CNN.com will also debut new clip-and-share video editing features. With DVR-like controls, clip-and-share makes everyone a CNN editor. Users can quickly fast-forward and rewind to the perfect start and end points to create powerful video clips, straight from the live feed. Clips can be shared with friends and followers directly through Facebook and Twitter. Once shared to these social circles, users can watch back the moments and create a direct URL or embed code for blogs and websites, and share their must-see moments via email, LinkedIn, or Google+.